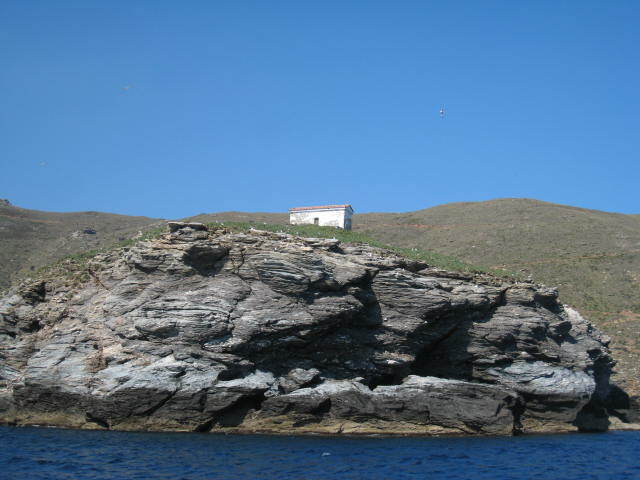 In distance of 100 meters from the beach you find the rocky island of Theotokos with a small church . The rocky island of Theotokos is acquaintance for the big colony of Mavropetriti, protected species of falcon, that each year it migrates from Madagascar to Androsfor reproduction. "That means that the visit in this place must be without to the falcon to be bothered. " The sea bottom round the beach is amazing and is offered for free diving and fishing by boat or land. You can visit Theotokos with our boats that you can rent for fishing, swimming, and you can try to take a photo from Mavropetriti that lives in this place.